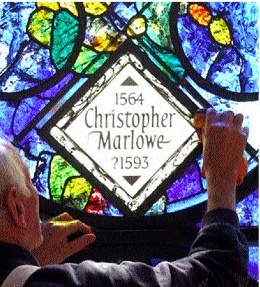 The evidence for Marlowe's slaying in 1593 is so dubious that Westminister Abbey in London features a question mark by the date of his death in a new stained glass window in the Poets' Corner, England's literary shrine. At Amber Waves Press, we find the case for Marlowe's survival and authorship of the Shakespearean works so compelling that we have started to publish them under his name as principal author. Unlike many skeptics, however, we hold that Will Shakespeare played an indispensable dramatic role in the partnership to bring out the plays and poems and recognize him as co-author/producer with Marlowe. Beginning with Hamlet and As You Like It, Amber Waves Press will bring out the collected works in specially annotated editions.